World of Greenland is a 100% Greenlandic company, locally rooted in Ilulissat. The company also services cruise ships and run Ilulissat Hostel. World of Greenland owns the eco camp Glacier Lodge Eqi, situated by the calving glacier Eqi. Anyone visiting Ilulissat should treat themselves to at least one boat trip. Navigating between icebergs is a unique experience. The sea route is Greenland’s main transport network giving access to sea mammals, birds, towns and settlements. 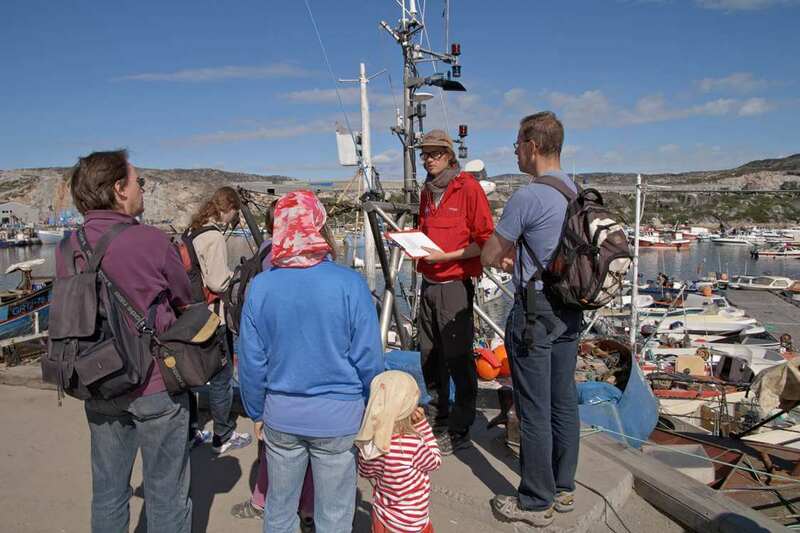 A boat trip with World of Greenland combines the worlds of nature and culture. Trips feature, for example, whale watching among the icebergs in Disko Bay and visits to the settlements of Oqaatsut and Ilimanaq, where World of Greenland can arrange for food to be cooked and served locally. The trip to the natural wonder of the Eqi glacier, 90 kilometres north of Ilulissat, is particularly popular. Spend the night at Glacier Lodge Eqi with its wonderful views of the glacier. Details of trips can be found on the company’s website. 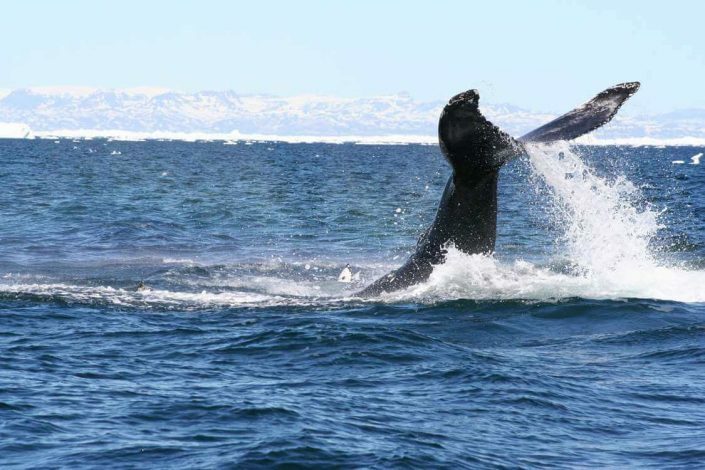 There are about 15 species of whale living in the waters off Ilulissat. Three of these – the beluga whale, the narwhal and the Greenland whale – spend the winter here. It is usually the humpback whale, the minke whale and the fin whale that project their bodies and tails above the water during the summer. The huge blue whales and killer whales are only rarely seen, but if you go whale watching with World of Greenland you have a chance of seeing them. A trip lasts four hours and you will be aboard the Targa which is a fast-moving vessel. The whales swim around Disko Bay. Sometimes they will swim close to the town and sometimes into the icefjord, and you can also see them further north at Arveprinsens Ejland. Ilulissat is the number one place for dog sledding in Greenland. A ride on a dog sled is a genuine Greenlandic winter experience, and a day trip is affordable for most people. Trips last for 2, 3 or 5 hours. The route taken is planned according to conditions. On the short 2-hour tour, the sled driver might take you along the edge of Disko Bay where you will enjoy sweeping views of the bay or you might head for the hinterland and the vantage point over the icefjord. You will be going up and down ”Little Akinnaq” – a steep hill which in fact is not that little at all. On a 5-hour sled ride you will have covered about 35 kilometres before you get back to base. The trip goes up over Store Akinnaq and of course down again with the dogs behind the sled. 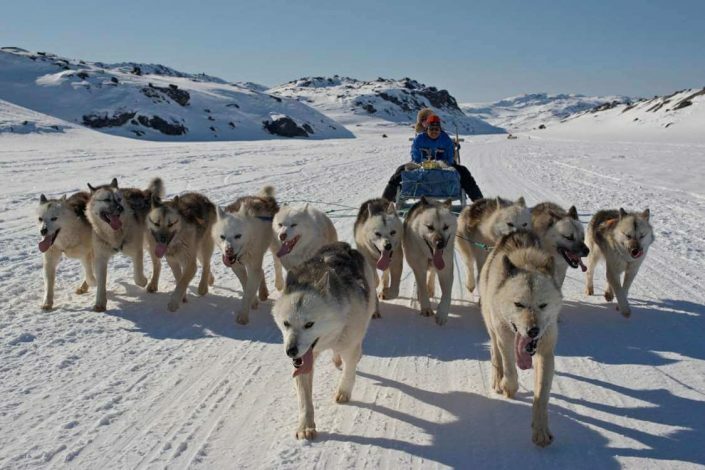 The trip offers fabulous views of the icefjord and you will get a sense of how strong Greenlandic sled dogs really are. If you want to experience the silence of the night, then head out on a 3-day sled ride to Aattartoq. The trip will take you to a beautiful glacier known as “The dead glacier”. You will be spending the night in one of the primitive huts or in a tent at the glacier. The return trip will take you past the ice cap if the route is viable. You should almost try to set foot on the spectacular ice cap. You can hire arctic winter clothing and boots for the trips. The midnight sun in Greenland is almost a state of mind. You will see mountains and mountain peaks bathed in a palette of pink, purple, yellow and red light. World of Greenland will take you on a midnight boat trip. The experience at night is unique when the icebergs take on the colour of warm sunlight. Not surprisingly, this natural phenomenon has been inspiring artists for decades. Summers can be cold – even on a bright night – so please remember to bring warm clothes with you for the trip or a set of comfortable sealskin clothes. On a guided historical tour of the town the guides will delve deeper into local history and give you an insight into Greenlandic culture. This is all information that will put your other experiences in Greenland into perspective. Head further out where Ilulissat’s beautiful icebergs will form the backdrop to a hike to the settlement of Sermermiut, situated a mile from the town. Various Inuit cultures have lived in the settlement for 4,000 years and today you can still see many remains testifying to their presence. A wider variety of hiking trips start out at the Glacier Lodge Eqi. You can go on a 2-day hike to the ice cap or a 5-hour trip to the moraine at the Eqi glacier. World of Greenland will take you sailing among the icebergs. 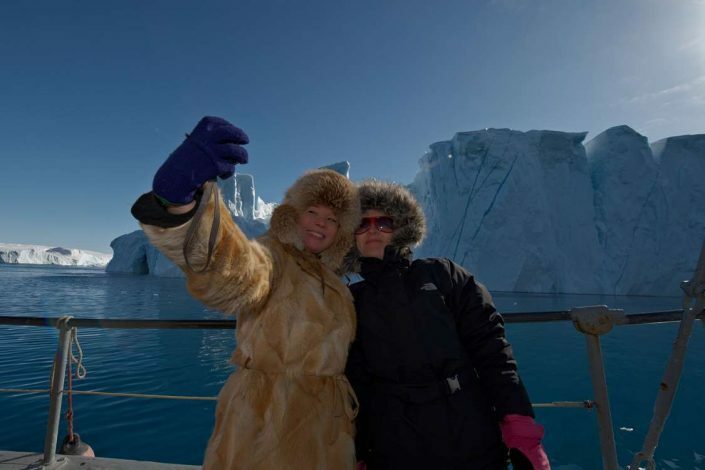 You will get right up close to these extraordinary sculptures of glacial ice towering majestically over the boat. Experience the kaleidoscope of colour, shapes and sizes – and see for yourself how no two icebergs are alike. The icebergs are the products of the glacier’s immense river of ice. They can be several hundreds of metres long on each side and tower more than 100 metres above sea level. Remember to wear warm clothes for the trip or hire a set of comfortable sealskin clothes before you set off. Greenland’s many wonders can be experienced from the land, sea and air. Why not fly with World of Greenland? The company offers various airborne excursions. They will fly you in a helicopter or plane over the icefjord and as far into the world-famous UNESCO-protected area as you can possibly go: the outermost edge of the mountain in front of the gigantic glacier. The trip will give you a wonderful experience which you will be able to record on film. To find out more about the various trips, please visit the website. Ilulissat is a modern Greenlandic town, but the old Inuit culture still makes its presence felt. It has left its deep mark on local history and culture. Not far from the town, for example, is Sermermiut which is an old Inuit settlement. 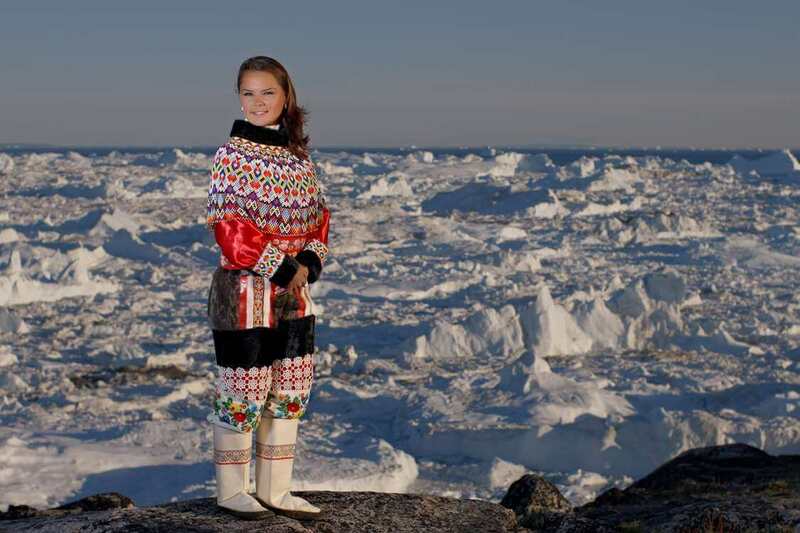 Different Inuit cultures have lived here for 4,000 years. World of Greenland will take you hiking to the settlement, will give you a guided historical tour of the town and will only be too pleased to answer all your questions. You are also very welcome to call in at the head office in Ilulissat. Few places offer an experience as complete as Ilulissat, where massive icebergs, calving glaciers and the ice cap are all close at hand. 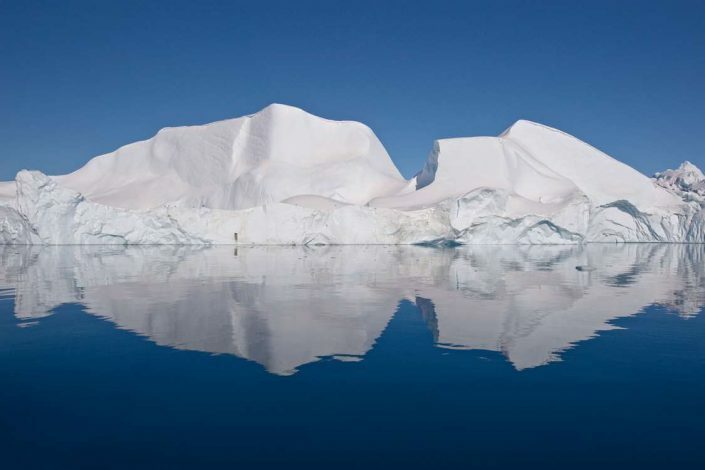 The question of when and whether the ice cap can be explored depends on a number of nature- and weather-related conditions, but you can rely on World of Greenland for expert guidance. Experience the great white sheet of ice from the air, in a plane or in a helicopter, from a dog sled or on foot clad in a pair of thick walking boots.